The organic reach for brands on Facebook has been hotly debated over the past few years as companies find their content efforts aren't as fruitful as they once were on the social media platform. What was once a key outreach channel that rewarded those who created quality content has now become a paid reach amplifier. Due to the reduction in organic reach bloggers and brands have been forced fork out an additional budget to match the numbers of previous years, which has also priced many out of these efforts as the newsfeed auction becomes more and more competitive. So it looks like Facebook looks to address this issue by splitting their newsfeed. 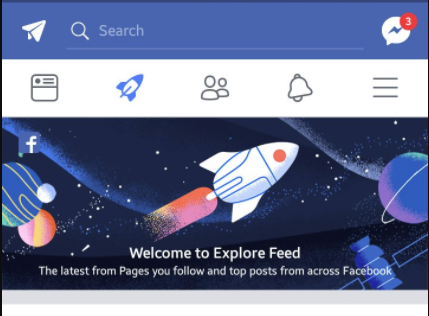 The Facebook News Feed is the centrepiece of the world’s largest social network service, which is a streaming series of posts such as photos from friends, updates from family members, advertisements and material from celebrities or other pages that a user has liked. All these content contributors compete for space on your newsfeed and obviously get your attention, some are weighted higher than others while others pay for the privilege. So with all of these contributors competing for your attention something has got to give. To even out this competition Facebook Inc announced it was testing the idea of dividing its News Feed in two, separating commercial posts from personal news in a move that could lead some businesses to increase advertising. The change could force those who run pages, everyone from news outlets to musicians to sports teams, to pay to run advertisements if they want to be seen in the feed that is for friends and family. While the brand section will have brands, you like competing on quality of content as well as how much money they're putting behind their posts. As of this week, the trail newsfeed is available in Bolivia, Cambodia, Guatemala, Serbia, Slovakia and Sri Lanka, and it will likely go on for months. This comes from the Facebook executive in charge of the News Feed, Adam Mosseri who stated this in a recent blog post. Mosseri said the company has no plans for a global test of the two separate feeds for its 2 billion users. Facebook also does not currently plan to force commercial pages “to pay for all their distribution,” he said. The newsfeed split is very similar to what Google did to Gmail a few years back when the introduced the promotions folder, which fundamentally changed their user behaviour when it came to promotions. The split feed may result in fewer users seeing your content. However, the users who do will be highly targetted, and your relevancy should increase, seeing lower bounce rates from organic reach. From a personal standpoint, I welcome the change since I have very little interest in what my 'friends' post on Facebook. If I do use Facebook, it's as a content and news discovery tool most times, when I'm not looking at memes recycled from Reddit or vine videos that have got a second wind via Facebook. But hey, that's just me! Also worth a mention is that with the two news feeds we could see fewer links to news stories with news proving a tricky area for Facebook. As a result of hoaxes and false news stories sometimes spread quickly on the network. Hopefully, this will mean less mini heart attacks thinking is Mr Bean or John Cena no longer with us :'(. Like any significant UX change, it will be greeted by equal parts love and hate, it's just how the internet loves to react, so pay it no mind Facebook. As long as users see more relevant content more often then the change will come out a winner. It is now up to Facebook to find the perfect balance between organic reach while still maintaining the profitability of its newsfeed real estate. What do you think of a split news feed? Good news or bad news for brands? Let us know in the comments section below.